You never know what’s going to happen with a side project. When The Sun Hits began as such eight years ago while its members were in their respective bands. Although they had done some work together, the project itself seemed to just get shelved, but as time went by things changed and the guys found themselves back together blowing the dust off what they had already started. 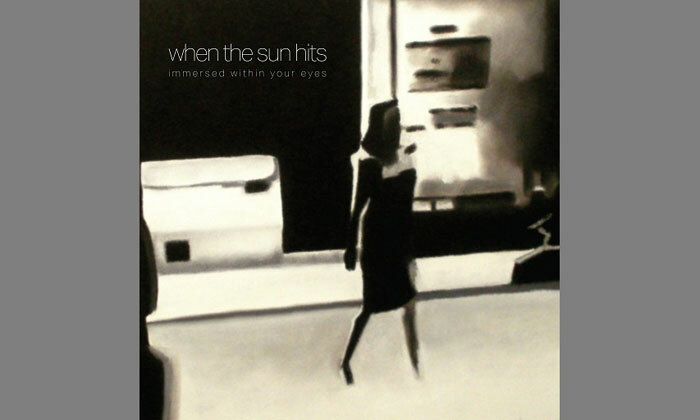 Since starting up again, When The Sun Hits are in full speed moving forward and six track EP ‘Immersed Within Your Eyes’ is just a taster of what’s to come. If you know the history of the band, you sense that now is actually the perfect time to unveil themselves. Opening track ‘The Last Night’ is a chilled number; vocalist Martin Orton creates an incredible atmosphere, and occasionally there’s a Verve-like feel to the music. The band are sending you to a different place; it’s dark but transcending, and a brilliant starter to the EP. The beauty of ‘Immersed Within Your Eyes’ is that lyrics are secondary to the instrumental enchantment that is happening here. ‘Twilight’ echoes around your head with no vocals, allowing a kind of emotional freedom just for a few minutes. ‘Steropium’ sounds immense on record, which only leaves one to imagine how amazing it’s going to sound live. There is definitely something special about this band, and their emersion marks some perfect timing; we have been needing to see more shoegaze bands like this pushing through and get the recognition that seems to be missing.